Please make sure your device is connected by a wired Ethernet cable into the back of the router when changing any of the configuration on your router, and not connected via Wi-Fi. Go to your internet browser – e.g. Internet Explorer, Safari, Google Chrome, Mozilla Firefox – and type 192.168.1.1 into the address bar and press enter. The home screen will now appear. You need to go to the top right hand corner and click sign in. Once you have entered your password, click sign in. If this password does not work, you will need to reset the configuration on the router by holding a pin/paperclip to the reset hole on the back of the router until the power light starts flashing. At this point, you can take the pin out and the router will take 5-10 minutes to sync back up with the Trooli equipment and you will then be able to access the router. You will then need to enter the username and password as detailed above. After you have signed in you will be prompted to change your password, however you may skip this if you wish to keep the default password. Please note: If you change the password and later on request support from Trooli we will require the password in order for us to log on to help you. 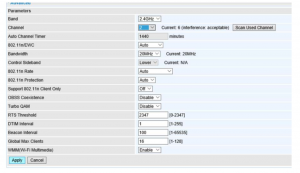 Wireless analyser: To help chose the best wireless channel on your router, the router includes a Wireless Analyser for both the 2.4GHz and 5GHz wireless bands. 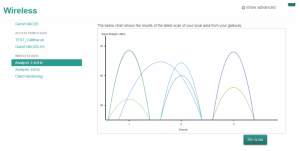 To use this, click on the Analyser for the band you want to configure and this will bring up a graph. Scroll down to see the option to Re-scan. By clicking this, it will present a fresh scan of your environment and pick up any devices operating on the channels in that band. Choose a channel that has the fewest devices operating. To change to that channel please follow these steps. Go to the wireless box on the right hand side of the screen and click the small setting button that appears when you hover your mouse over the wireless box. 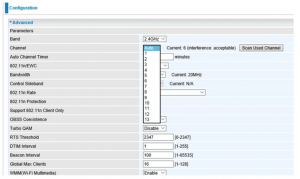 You will then come a screen where you can change your wireless channel from a drop down list. Depending on wireless interference in your location, you may need to change this a few times to find a suitable channel for your area. We recommend wireless channels 1, 6 or 11. 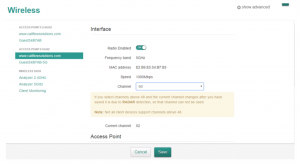 Once you have selected your desired wireless channel, a save button will appear at the bottom of the page. Click this button. 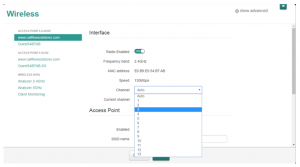 You will need to repeat the steps for the 5GHz bands, you need to click on www.callflowsolutions.com under the header ‘access points 5GHz’, this is located to the left hand side of the page. 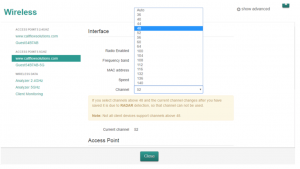 To change your wireless channel you need to select a number from the drop down list highlighted. If your selected channel does not improve your wireless connection then go back to the previous step and select an alternate channel. Go to your internet browser – e.g. Internet Explorer, Safari, Google Chrome, Mozilla Firefox – and type 192.168.1.254 into the address bar and press enter. To check you are connecting to the correct router you will see the router model number shown the top of the logon screen. 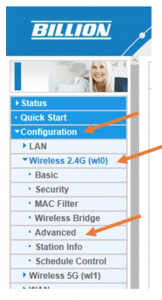 Once logged in you need to click on Configuration > Wireless 2.4G > Advanced which are all located to the left hand side of the page. Depending on local wireless interference, you may need to change this a few times to find a suitable channel. We recommend wireless channels 1, 6 or 11. Once you have selected your desired wireless channel, scroll down using the slider on the right hand side and click Save. Now repeat for the 5GHz bands. Click on Configuration > Wireless 5G > Advanced which are all located to the left hand side of the page. Once you have selected your desired wireless channel, scroll down and click Save. If your selected channel does not improve your wireless connection then go back to step 4 and select an alternate channel.